Not to be confused with Darren Thomas. Darron Varnell Thomas (born May 23, 1990) is a professional American football quarterback for the Washington Valor of the Arena Football League (AFL). He was the starting quarterback for the University of Oregon football team that reached the 2011 BCS National Championship Game and won the 2012 Rose Bowl. Thomas was born in Houston, Texas on May 23, 1990 to Latina Thomas and Darren Waters. Thomas attended Aldine High School in Aldine, Texas. As a freshman at Aldine, Thomas played as a running back. During summer practice before Thomas' sophomore year, Aldine head coach, Bob Jones, had the idea of switching Thomas to quarterback to run his spread offense. Thomas was opposed to the switch, but made it anyway. During his senior season, Thomas verbally committed to Louisiana State University. When the LSU recruiting class for quarterbacks became 3 members, Thomas de-committed. Thomas committed to the University of Oregon on December 14, 2007, choosing Oregon over scholarships from Florida, LSU, Miami (FL), Minnesota, Missouri, Nebraska, and Oklahoma State. "Oregon Football Commitments". Rivals.com. Retrieved October 30, 2013. "2008 Oregon Football Commits". Scout.com. Retrieved October 30, 2013. "ESPN". ESPN.com. Retrieved October 30, 2013. "Scout.com Team Recruiting Rankings". Scout.com. Retrieved October 30, 2013. "2008 Team Ranking". Rivals.com. Retrieved October 30, 2013. Thomas completed his career at Oregon with a 24–3 record as a starter, leading the Ducks to two consecutive Pac-12 Championships, including appearances in two BCS Bowl games. Just months removed from Aldine High in Houston, Thomas came off the bench as a true freshman to lead a stirring second-half rally against Boise State in his first collegiate game. Thomas tossed three touchdown passes in the fourth quarter to rally Oregon from a 24-point deficit. The Ducks lost to Boise State 32–27 but his unexpected debut and impressive performance led many fans to believe he would be the true successor to Dennis Dixon, however, he would continue to backup Jeremiah Masoli for the remainder of the 2008 season. After redshirting the 2009 season, Thomas became the starting quarterback for the Ducks in 2010 after previous starter Jeremiah Masoli was suspended for the 2010 season and eventually dismissed from the team. In his first season as a starter, Thomas threw for 2,881 yards and 30 touchdowns, leading Oregon to a 12–0 regular season record, and an appearance in the 2011 BCS National Championship Game against Auburn. In that game, Thomas threw for 363 yards and two touchdowns, but also threw two interceptions. Auburn would ultimately go on to win 22–19, with a last-second field goal. After the season, Thomas was named as a 2nd Team All-Pac-10 Conference selection at quarterback and the co-recipient of the Skeie’s Award as the team’s most outstanding player. During the 2011 season, Thomas threw for 2,761 yards, and a single season school record of 33 touchdowns, leading the Ducks to the 2012 Rose Bowl, in which Thomas threw for 268 yards and 3 touchdowns to propel Oregon to a 45–38 victory over Wisconsin. The Ducks finished the season 12–2 (8–1 Pac-12) with a #4 final season ranking. At the end of his junior season, Thomas surprisingly chose to forgo his senior year to enter the 2012 NFL Draft but was neither drafted nor signed as an undrafted free agent by any NFL team. He was rated the 17th best quarterback in the 2012 Draft by NFLDraftScout.com. On October 9, 2012, Thomas signed a practice roster agreement with the Calgary Stampeders of the Canadian Football League. He would later sign with the Lincoln Haymakers of the Champions Professional Indoor Football League but never played a game for the Haymakers. Thomas was assigned to the Portland Thunder of the Arena Football League on October 10, 2013. Thomas fits in with the ownership's promise of getting players with Oregon ties. Thomas started the first three games of the season for the Thunder before being benched in favor of Danny Southwick. Thomas became the primary back up for the Thunder since losing his starting position. Entering his second season with the Thunder in 2015, Thomas was once again the backup quarterback to Kyle Rowley. Thomas participated in the NFL's first Veteran Combine in March 2015. On January 27, 2016, he was named head coach Chris Miller's franchise player in Major League Football. The team was to be called the Oregon Crash but the season never started. Thomas was assigned to the Portland Steel on April 25, 2016. He made his only start of the season on May 10, 2016, against the Los Angeles Kiss, completing 25 of 49 passes for 259 yards, 3 touchdowns and 5 interceptions in a 66–27 loss. On October 28, 2016, Thomas signed with the Arizona Rattlers, who joined the Indoor Football League a week prior. Thomas played in 5 games for the Rattlers in 2017, completing 54 of 93 passes for 576 yards, 13 touchdowns and 4 interceptions. He also scored four rushing touchdowns. On July 8, the Rattlers defeated the Sioux Falls Storm in the United Bowl by a score of 50–41. On February 5, 2018, AZ Central Sports columnist Richard Obert reported that Thomas was traded to the Cedar Rapids Titans in exchange for local Arizona product Jordan Gehrke. Thomas was released by the Titans on February 21, 2018. On May 17, 2018, Thomas signed with the Massachusetts Pirates of the National Arena League. ^ a b c d Tom Friend (January 7, 2011). "Darron Thomas drives the Ducks". www.espn.go.com. ESPN Internet Ventures. Retrieved October 30, 2013. ^ Kevin Spain (August 21, 2007). "LSU gets commitment from Texas QB". www.nola.com. NOLA Media Group. Retrieved October 30, 2013. ^ Andy Staple (January 7, 2011). "How Oregon's main contributors rated as recruits". www.sportsillustrated.com. Time Inc. Retrieved October 30, 2013. ^ "Darron Thomas". www.rivals.com. Yahoo!. Retrieved October 30, 2013. ^ "Darron Thomas". www.scout.com. Microsoft. Retrieved October 30, 2013. ^ "Oregon's Darron Thomas isn't the quarterback you remember from Boise State rally; he's better". The Oregonian. September 2, 2010. ^ "#1 Darron Thomas Biography". GoDucks.com. Archived from the original on August 22, 2010. Retrieved September 4, 2010. ^ "PAC-10 FOOTBALL AWARDS AND ALL-CONFERENCE TEAM ANNOUNCED" (PDF). www.uclabruins.com. Pac-10 Conference. December 7, 2010. Retrieved October 30, 2013. ^ a b "Darron Thomas". nfldraftscout.com. Retrieved August 29, 2016. ^ "Four added to practice roster". Stampeders.com. October 9, 2012. Retrieved August 19, 2013. ^ "Haymakers Sign Former Oregon Ducks QB Darron Thomas". www.oursportscentral.com. OurSports Central. August 21, 2013. Retrieved August 21, 2013. 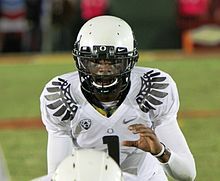 ^ "Portland Lands Former Oregon QB Darron Thomas". www.oursportscentral.com. OurSports Central. October 11, 2013. Retrieved October 11, 2013. ^ Aaron Kasinitz (June 30, 2014). "Darron Thomas continues quest to regain success from Oregon days despite several pitfalls". www.oregonlive.com. The Oregonian. Retrieved July 1, 2014. ^ Steve Brandon (April 28, 2015). "Darron Thomas looks good in brief QB duty for Portland Thunder". www.portlandtribune.com. Portland Tribune. Retrieved April 29, 2015. ^ Greif, Andrew (March 25, 2015). "After taking another shot at the NFL, former Duck Darron Thomas now waits". oregonlive.com. Retrieved April 26, 2016. ^ "Steel Sign Former Oregon Quarterback Darron Thomas". arenafan.com. April 25, 2016. Retrieved April 26, 2016. ^ "Steel Fall Behind Early Against LA KISS, Lose 66-27". arenafootball.com. May 10, 2016. Retrieved December 6, 2016. ^ Richard Obert (February 5, 2018). "QB Jordan Gehrke hopes to be next local player to help Arizona Rattlers win title". AZCEntral.com. ^ "Transactions". goifl.com. Retrieved March 26, 2018. ^ "Darron Thomas". arenafan.com. Retrieved November 26, 2016. Wikimedia Commons has media related to Darron Thomas.